To paraphrase Pitbull, you always have to be hustling. Now some hustles take lots of sweat equity, while others are easy-peasy. Here’s one of the latter, and proof that it works. I’m talking about Ebates. The amount of cash back is normally a percentage of your purchase, and varies by store. Usually, it is stackable with promotions and discounts if they’ve already been applied automatically by the store. 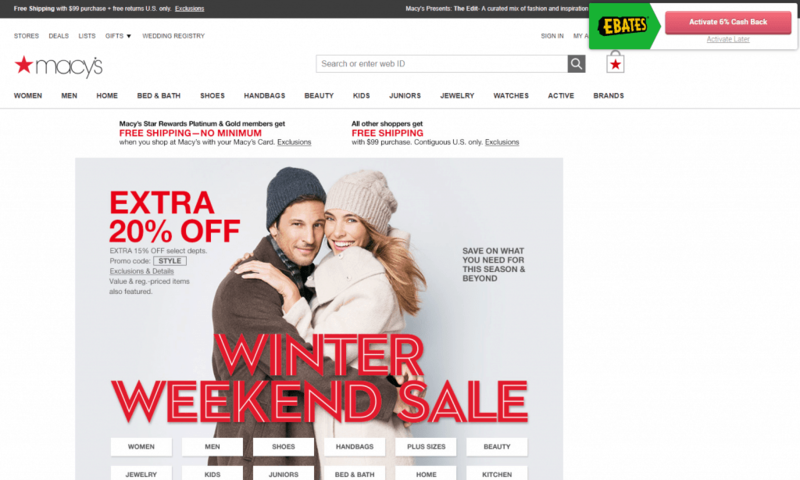 If you need a separate coupon code, Ebates may not stack (meaning you have to choose either the store’s coupon code or Ebates; though it doesn’t hurt to still try, by activating Ebates via the browser extension). Indeed it does. If you’ve activated Ebates and buy something, you will start to accumulate online shopping credit in the form of cash back in your Ebates account. Then, they’ll pay you every 3 months, either via Paypal or an old-fashioned rebate check by mail. And it’s real money, not any sort of points or miles or anything else – and if you use a rewards credit card, you still get the credit card rewards, for double the fun! Is It The Best Option for Getting Online Shopping Credit? Sometimes. 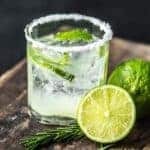 I know that, at least theoretically, you can sometimes get more value back by going to an online store through a credit card or airline shopping portal, and getting big bonuses in terms of credit card or airline points. 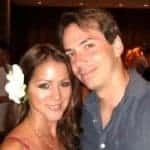 However, actually using those points and miles in the most effective way possible normally requires a lot of expertise in navigating credit card and airline rewards programs (or paying an award booking service to do it for you). 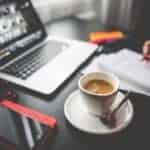 I also note that there are competing sites and portals that you can also use to get cash back; usually, the best way to find out which one is most lucrative for a particular store is to use a comparison site like Cashbackholic and evreward. There, you just enter the name of the store you want, and it’ll show you a list of programs and how much you can get back with each. 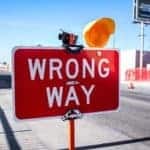 Be aware, however, that such lists are not always up to date, so you still have to manually verify any portal you want to use. So I’m not going to claim that Ebates is always the way to get the absolute maximum value out of your online shopping purchases. However, it’s usually a very good one, lucrative, and extremely easy to use. In fact, if you use the browser extension, one click is all it takes. Still, for large purchases, I recommend you check out Cashbackholic first, since another program may give you a much better deal. Also, if you have an Amex card, be sure to verify if there’s a good Amex offer (which you can stack with Ebates). 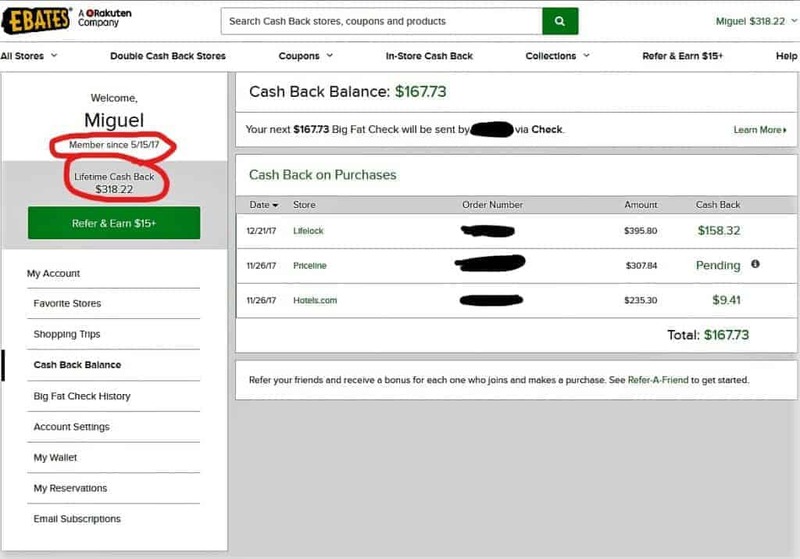 To ensure you get cash back and see that rebate check in your mailbox, make sure to take a look at your Ebates account every so often (especially after a big purchase). The system is not flawless, and sometimes it fails to register a sale even when you activated Ebates. In fact, that happened to me with the computer, and I had to notify Ebates. They did solve the problem quickly, though, and I got the money. To be fully frank, I have to give credit to my wife Lily here. When I first heard of Ebates, I thought it was either some gimmick or that it would require you to jump thought lots of hoops or just have a low rate of return. At Lily’s insistence, I signed up and used it when I bought the computer. And that turned me into a believer. As I saw for myself, Ebates is the real McCoy. It’s incredibly easy to use if you install the browser extension, and indeed pays out as promised, in often-big amounts. So give it a try, and get yourself that rebate check! 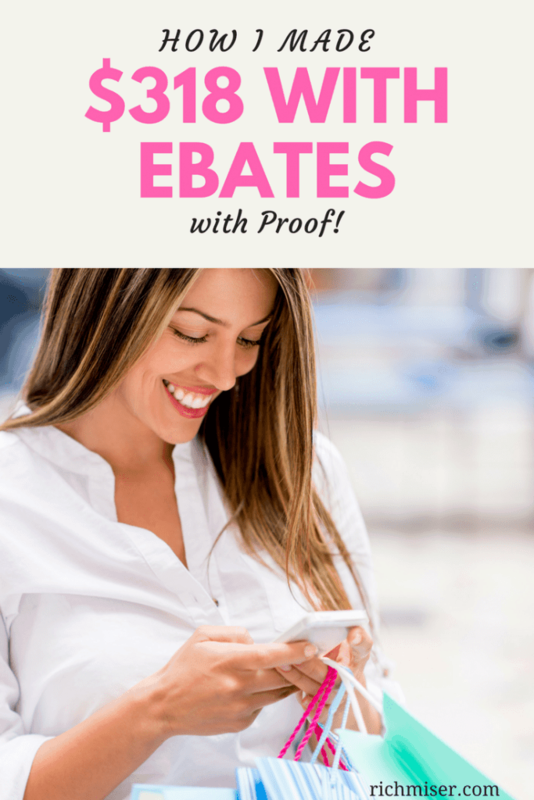 Have you ever used Ebates to get cash back? Is there anything else you use for online shopping credit? 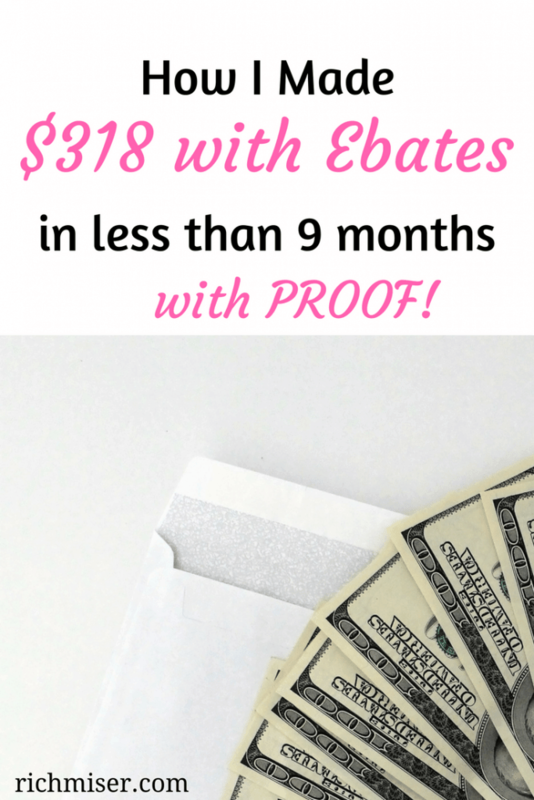 Does Ebates work for you? *The Ebates links in this post are my referral links. If you sign up for Ebates using them, I can get a commission. You don’t have to, but I appreciate it if you do. This is not a sponsored post; everything here is my opinion and Ebates has no idea I wrote this. I used to be a big points-and-miles guy, but increasingly find them hard to use in the optimum way (unless you devote lots of time to it or spend money on an award booking service). I love Ebates because it’s in addition to any credit card rewards you earn. This is a great review. I too am hesitant to jump on the Ebates bandwagon, but I’ve seen several instances of people earning cash back and I don’t think I can keep passing up the free money. Thanks! Yeah, I’m glad I signed up; with the browser extension it’s very easy to use. I should be getting my first check from them soon; excited! I bought a Samsung TV a couple months ago and that put me over the limit to be qualified for a payout. I like them because the credits are automatically applied while you shop online. They do all the work for you. eBates is nice – the browser extension makes it super easy. I have it installed on both my Firefox and my wife’s Firefox. Interesting, I just did an ebates article as well. That’s some pretty cashback earned there! I don’t do a lot of shopping on sites that partner with Ebates in Canada (except for Amazon and Bestbuy), so don’t have a lot in cashback earned yet. I find it easy to use, and with the browser extension, I get a reminder whenever there are opportunities to get something back. Yeah, it’s super easy to use. 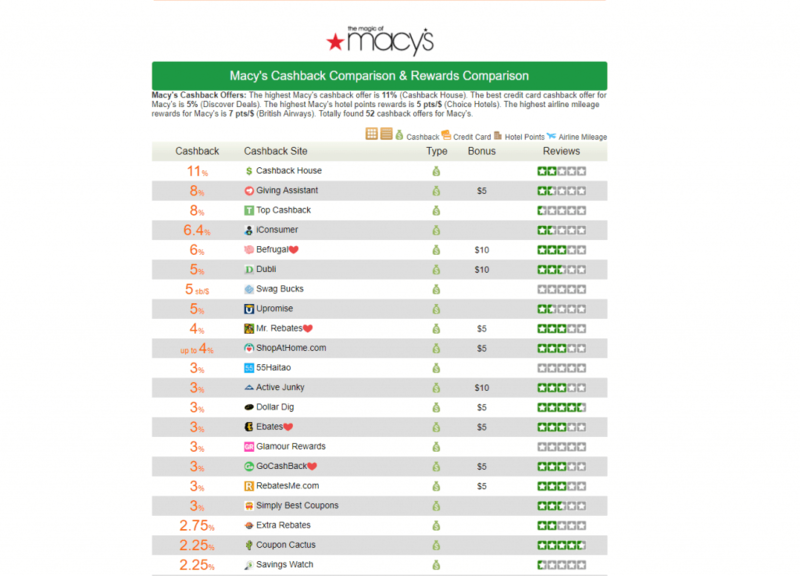 For most sites, the cash back seems to be in the single digits. However, fairly often you come across 10% plus. On large purchases, it adds up quickly! I should get on this leaving money on the table. It isn’t super significant but its free money! I did Ebates a few years back but I should get back on it. It’s hard to remember to log in or use the portal to online shop. Doing it through Amazon is a no brainer too, I should remember! Thanks for sharing your proof! I agree, portals can be cumbersome to use, and easy to forget. I really recommend the browser extension, which lets you know, automatically, when you’re on an Ebates-compatible site. I’ve been using Ebates for a couple of years now and like it. I wish I’d started using it sooner. I love the browser extension. Without it, I’d forget about checking Ebates before I made an online purchase.